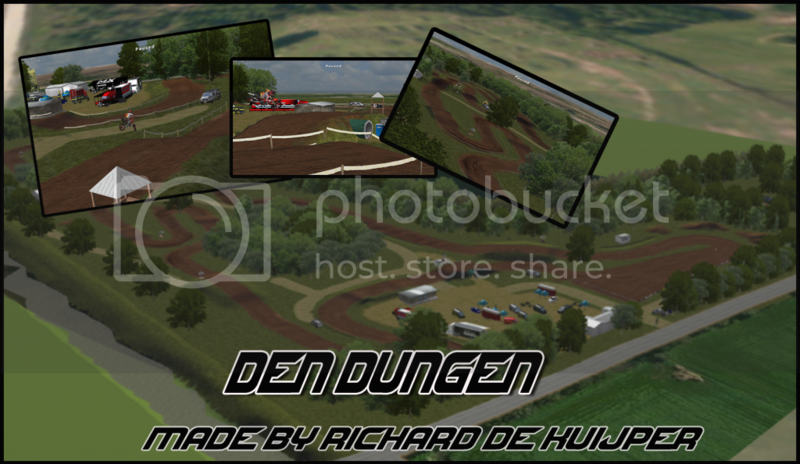 Here is my new track, it is a replica track of Den Dungen in The Netherlands. i made this track because there are a lot of nice jumps in it and its a track where i ride at real life. -Dion Huybers for help me whit the decoration and the map, the skybox en some other good things. LOVE this track. It really feels like a local track. And I don't think the jumps are too small at all. Except for a couple of little doubles (which I assume is how it is in real life).... FANTASTIC! Nice, i really liked the flow of the track, it feels as if you're riding it in real life. Most of the jumps are the right scale, the table before the start straight is slightly overscaled. The ruts ride really well, although they look unrealistic and to big. The bumbs are way to big and look more like rolers and whoops to me. I really liked the environment, because the trees and everyting are placed at the same spots as it is in real life. Dont let my criticism put you off making tracks, as i think this one of the best replicas of a dutch track. thx to the reactions, great! i know some things look like a wave but it's mxs you know , for mxs better i think. about the jumps, in real life they are not big or something like that.